2017 ATLANTIC HURRICANE SEASON IS 43% DONE! On this Saturday 19 August we are eleven weeks and two days into the 2017 Atlantic Hurricane Season, which means the ‘official’ Atlantic season is now 43.4% complete. Technically this means we have fourteen weeks and five days left in the season, unless Mother Nature decides to do something different. More important than how much time is left for the official 2017 Atlantic hurricane season to be over, is the fact that we are approaching what historically has been the peak of the Atlantic season, the first half of September. The Atlantic has been busy with tropical cyclones so far in 2017, with eight named storms so far; Tropical Storm HARVEY, now in the east-central Caribbean and moving in the general direction of Belize and the Yucatan, is the 8th named tropical cyclone in 2017 in the Atlantic basin. 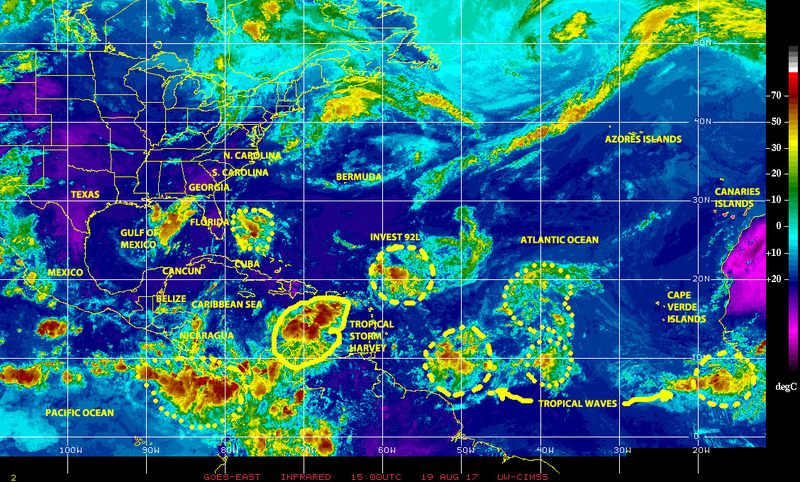 In what could be a possible sign of things to come during the approaching peak of the season, there are several tropical waves and areas of disturbed weather following behind HARVEY to the northeast of Puerto Rico and along ‘hurricane alley’ all the way to the eastern Atlantic waters off the coast of equatorial Africa south of the Cape Verde Islands, which could be seeds for potential cyclogenesis in the basin. 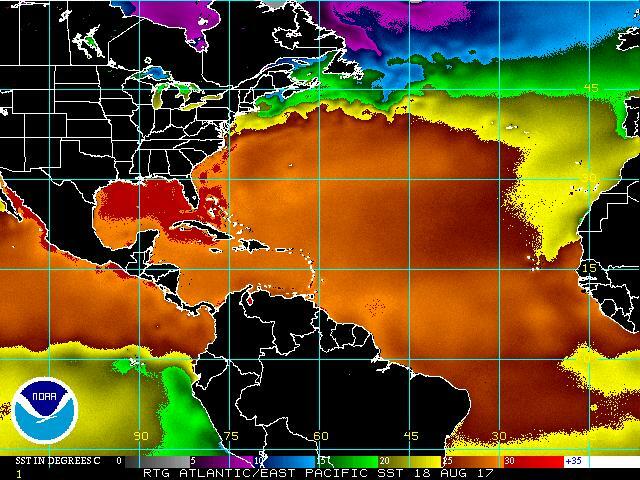 A possible contributing factor to such potential cyclonic activity could be the rather warm surface waters along ‘Hurricane Alley’, in the Caribbean and the Gulf and other areas of the Atlantic basin. On the other side of the continent, over the eastern waters of the north Pacific, the 2017 hurricane season that officially started on 15 May has also been a busy one so far, with eleven named tropical cyclones in 13 weeks. 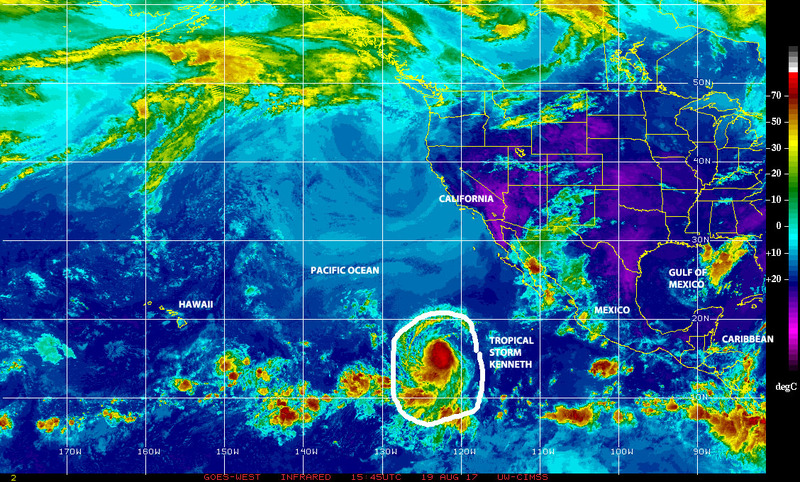 The latest tropical cyclone there is Tropical Storm KENNETH now moving NNW and away from land. All interest affected by cyclonic activity generated in the Atlantic basin and in the eastern north Pacific sub-basin must pay attention. Get ready. Be prepared. Remain alert. MITIGATE! A burst of cyclonic activity at two extremes over the vastness of the Pacific ocean in recent days has generated the six named tropical cyclones we see this Tuesday 25 July 2017! 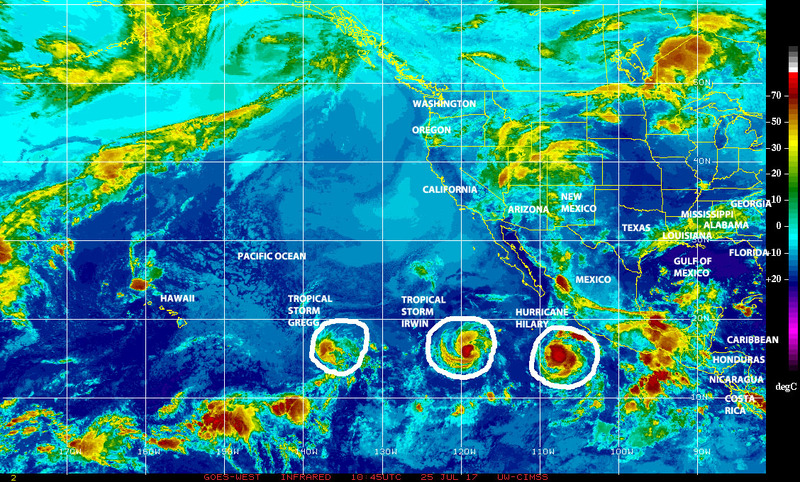 Tropical Storm GREG, a strengthening and about to become major Hurricane HILARY, and an also strengthening Hurricane IRWIN are active, and moving away from land, off the Pacific coast of Mexico over the northern East Pacific. This makes it a total of nine named tropical cyclones in the course of ten weeks in this quite active sub-basin for cyclogenesis. Also on this day, more than 12,000 kilometers to the west, over the northwest Pacific, we see a strengthening Typhoon NORU and a decaying Tropical Depression KULAP to the west of Japan, a strong tropical wave designated as ‘Invest 99W’ by NOAA approaching the Philippines, and some 3.000 kilometers farther to the west Tropical Storm SONCA making landfall in Vietnam. 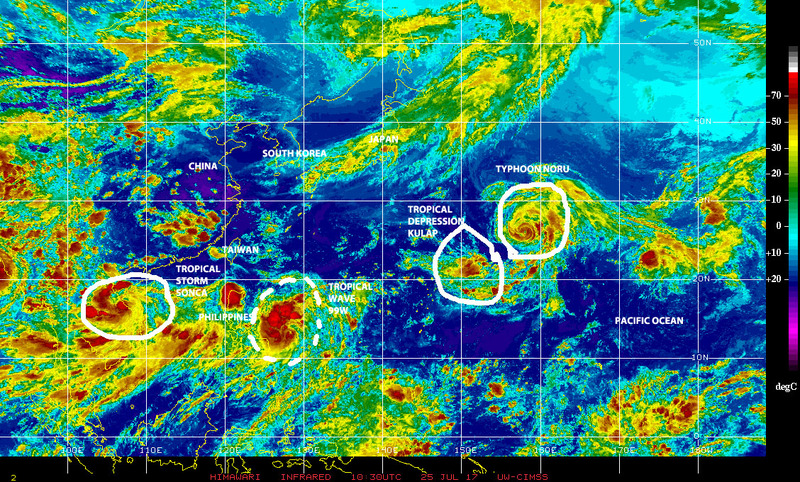 Quite a spectacle indeed, six named tropical cyclones and a possible seventh, all simultaneously active over the northern Pacific Ocean. Closer to our neck-of-the-woods here in Florida, and the Gulf and Atlantic coastal regions the tropics are somewhat calm. There have been one off-season named tropical cyclone, ARLENE, in April, and three named storms since the ‘official’ start of the 2017 Atlantic Hurricane Season, including short-lived Tropical Storm DON, which perished over the southeastern Caribbean just last week. So, busy there, relatively quiet here, however we should keep in mind this is the time of the year when the northern tropics get busy with cyclonic activity. Get ready! Be prepared! MITIGATE!